It’s again time to climb outdoor, since the weather gets much cooler but not yet cold. 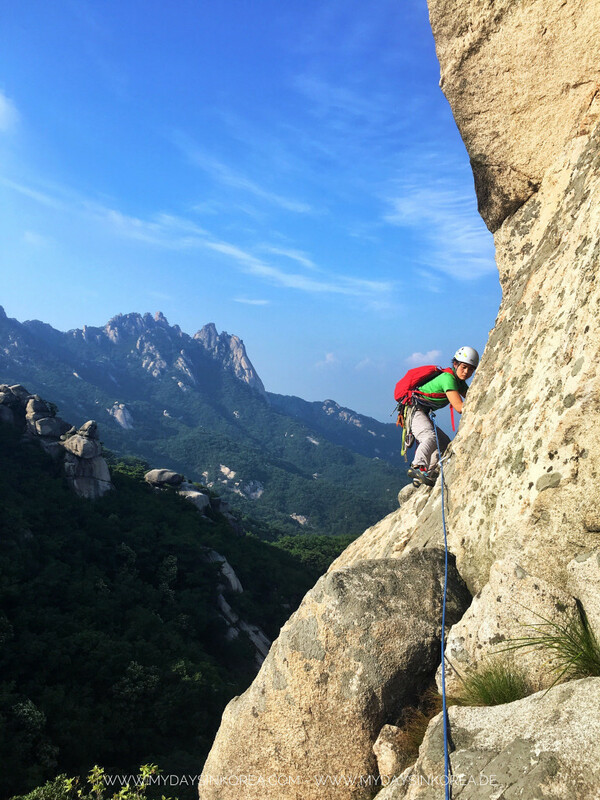 If you live in Seoul but don’t have time to go to the mountain for climbing, try to visit one of some artificial rock walls in Seoul, for example in Eungbongsan Rock Park. How to find the Eungbongsan Rock Park? Source: naver.blog; Information may vary. Closest subway station: Eungbong, Exit 1, then about 20 min walk uphill. If you don’t want to walk far, you can reach the park at best by bus. The closest bus stop is “Eungbongdong Hyeondae Apartment”. Seoul is surrounded by many mountains, so that you can see them from almost everywhere in the city. In beautiful weather, you don’t have to go far away to have great mountain experiences: you can go for a hike e.g. on the Seoul city wall or go rock climbing in Insubong. A lot of multi-pitch routes from 5.6 to 5.12a, as well as boulder tours are there for you to try out.